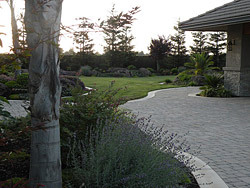 No landscape in San Joaquin Valley and East Bay Area will be complete without pavers and paving stones. After all, landscaping is not just about arranging plants. It's about transforming the outdoor into a relaxing, elegant, and fun living space. And pavers and paving stones should be a part of that transformation. Choosing pavers and paving stones over asphalt and the traditional concrete has more benefits than just improving the aesthetics. They are more affordable, easier to repair, more durable, easy to install, flexible, and requires low maintenance. The raw materials needed to install pavers and paving stones may be costly. But think about the long-term benefits. Since they require low maintenance and easier repair, they sure cost a lot cheaper than asphalts and concretes that require stressful and expensive repair and maintenance. The variety of colors, sizes, shapes, textures, and looks of these landscaping materials makes it possible to achieve the perfect and unique outdoor space for every home. Blue driveway, heart-shaped walkway, neon-colored patio, glittery pool deck, and more is possible. Only your imagination can limit the possibility with pavers and paving stones. Pavers come in different types and all of them offer various benefits to homeowners. Concrete pavers are the officially known paving stones. These types of pavers are the cheapest of all because it comes from the usual concrete, only fancifully transformed to imitate the look and feel of natural paving stones. Natural pavers are also called flagstones. Since they are natural, they are also very durable compared to concrete and other types of pavers. Flagstones come in different types also like slates, travertine, sandstone and bluestone that will give flexibility on design. Not only that interlocking pavers are easily maintained, they can be easily installed too. They are simply laid down on a blank landscape and put together like puzzle pieces. Interlocking pavers can last for so many years, too, making it durable enough for any application. They're easily maintained also because if one part is broken, it can be simply replaced without touching the other parts. Perfect with plants and stylish. Permeable pavers are just like the interlocking pavers. The only difference is that water is allowed around or through them, making them perfect around plants. One interesting sub-type of this is the grass and turf pavers which allow plants to grow up through them. Get that real vintage look with recycled pavers and paving stones. These come from materials that were once used for other buildings but are salvaged to be used for landscaping. Besides the elegant vintage look, using these pavers is also helpful for the environment. Imagine these pavers and paving stones laid out on the outdoor space. Can you feel the warm and welcoming appeal? The entire family, guests, and even passers-by will surely feel the same. Start the transformation of your outdoor into a comfortable living space today with Design West Landscaping. 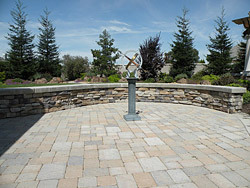 We have been helping homes in San Joaquin Valley and East Bay Area to have the best outdoor living space since 1991. We will be with you from planning to installation and even maintenance of your pavers. It's time that your bare landscape is transformed into a convenient living space. Contact us today.